This page covers the author of The Devil in the White City: Murder, Magic, and Madness at the Fair that Changed America. For other authors named Erik Larson, see the disambiguation page. Erik Larson has 1 media appearance. Erik Larson discusses The Devil in the White City: Murder, Magic, and Madness at the Fair that Changed America. The Winnetka-Northfield Public Library hosts two events with the author of the #1 New York Times bestseller about the sinking of the Lusitania in May 1915. On the 100th anniversary of the Lusitania disaster, comes the enthralling story of the sinking ship from Erik Larson. 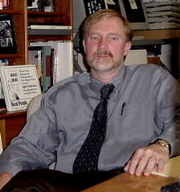 Erik Larson is the author of four national bestsellers: In the Garden of Beasts, Thunderstruck, The Devil in the White City, and Isaac's Storm, which have collectively sold more than 5.5 million copies. His books have been published in fourteen countries. The bestselling author of The Devil in the White City and In the Garden of Beasts speaks about his latest and instant bestseller, the dramatic and emotionally powerful story of the sinking of the Lusitania in the Atlantic Ocean in May 1915. Luncheon. Erik Larson's book Dead Wake was available from LibraryThing Early Reviewers. Erik Larson's book Hotel Angeline: A Novel in 36 Voices was available from LibraryThing Early Reviewers. "Erik Larson" is composed of at least 2 distinct authors, divided by their works. You can edit the division. Erik Larson is composed of 3 names. You can examine and separate out names.